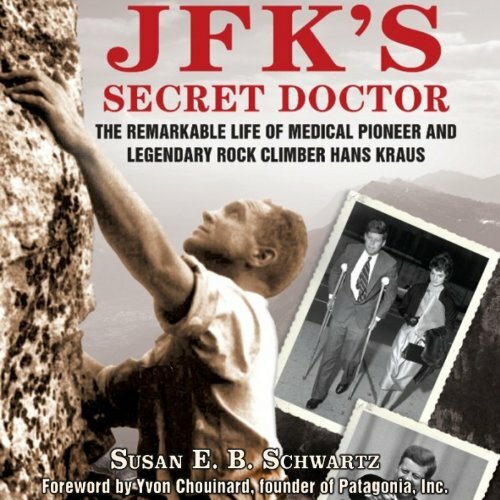 Austrian doctor and rock climber Hans Kraus was a medical visionary whose life was crowded with remarkable experiences. He learned English from James Joyce, escaped Nazi-dominated Europe, and eventually cured John F. Kennedy's back pain using the then-groundbreaking theory that exercise and activity could combat muscle problems. Award-winning narrator Joe Barrett perfectly evokes Kraus' verve and wit, and while he provides characters with distinct accents, he takes care not to overdo. However, Barrett's versatility is most illustrated in his dignified and subtle treatment of Kraus' personal tragedies, particularly with the doctor's poignant battles with depression. ©2012 Susan E. B. Schwartz (P)2013 Audible, Inc. Fantastic storytelling recounting the life of Hans Kraus. It will appeal to the climber, history buff, medical officianado. Touching recount of this pillars life. We need more people like Dr. Kraus in healthcare. If you have any connection to healthcare as a patient, employee or leader, you will appreciate this book.